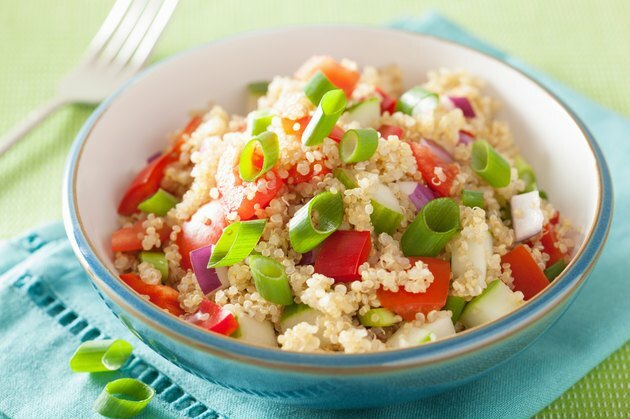 Bulgur comes from an ancient style of processed grain, called "groats." The wheat is cooked and then dried again, leaving its starches in their cooked form and ready to rehydrate quickly. The bulgur kernels are then milled into fine, medium and coarse pieces. The fine pieces are soaked in hot water to make tabbouleh and other salads, the medium are used to stuff meats and vegetables, while the larger, coarser pieces are cooked like rice to make pilaf. A rice cooker can be used to make this easier. Saute onions or other aromatic ingredients called for in your recipe. Lamb fat, clarified butter and olive oil are the traditional cooking fats of the region, but feel free to use your normal oil. Transfer the aromatic ingredients, if any, to your rice cooker. Add 2 cups of coarse bulgur and 4 cups of water, a pinch of salt and any remaining ingredients specified in your recipe. Press down the start lever on your rice cooker. Cooking time will vary according to brand and model, but your bulgur will usually be finished in 15 to 20 minutes. Remove the lid when your rice cooker signals the end of the cycle. Let steam evaporate from the bulgur for five minutes, then fluff and stir it with a fork to ensure that all flavoring ingredients are mixed in. Serve hot. Use medium bulgur to make hot breakfast cereal in your rice cooker, with dried fruit and cinnamon. Use fine bulgur to make a dessert similar to rice pudding. Cook the bulgur with milk and cream, sugar, vanilla or rose water, dried fruit, cinnamon or citrus zest. Why Does the Human Body Not Digest Corn?